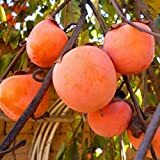 Persimmon plant for sale – You can grow a persimmon tree from seeds, cuttings, suckers or grafts. However, the best quality of Persimmon plant for sale comes from grafted or budded trees. Choose grafts with nicely developed roots. Soil – Persimmons are not particularly picky when it comes to soil type but they will do great in a well-draining soil with pH of 6.5 to 7.5. Dig a planting hole that is about the same depth as the root and twice as wide. Mix 8 inches of soil and loam in the bottom of the hole, then fill it with loam and native soil once the grafted tree is placed. Do not fertilize at planting time as this may burn the roots of your young tree. Location – an area with full sun is preferred for growing a persimmon tree, although it may tolerate some shade. Watering – water young trees well until they are established. After which, you can decrease watering schedule to at least 10 minutes once or twice a week in the spring and summer as persimmons are tolerant to drought. Do not overwater. The soil should be somewhat dry before watering again. You may mulch the entire planting area up to a few inches away from the trunk to keep moisture from accumulating next to the bark. Fertilizing – no fertilizing is needed in the time of planting. And feed your persimmon tree only when it is not growing well. If mature leaves are not deep green and shoot growth is less than a foot per year, apply a balanced fertilizer in late winter or early spring. Take note that excessive fertilizing in persimmons may cause premature fruit drop. Pruning – very little pruning is required with older growing persimmon trees as long as they are bearing fruit. Simply prune limbs that are crossing and dangling. Moderate pruning also help reduce the tree’s tendency to be alternate bearing. The best time to prune is late winter or early spring, when the tree is dormant. Harvesting – Persimmon trees yield fruits 3 to 4 years after planting. Harvest your astringent persimmons when they are completely soft which means they are fully ripe. If you see birds eyeing them, you may use bird proof nets to protect your crops. Or you can pick them earlier and wait until the flesh is completely colored, usually light yellow-orange to dark orange-red. Allow them to continue to ripen indoors or in a cool spot until they reach the right level of softness. 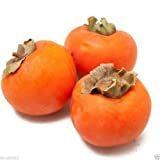 Non-astringent persimmons are eaten while it is still crisp and firm and should be harvested when they have their full deep color. They will continue to ripen off the tree and allowing them to soften at room temperatures will help with the taste. Check what variety your plant is.